The Soft Music Piano Bridge Over The Classics And All That by Hens Vlam-Verwaaijen is a series of light, technically uncomplicated piano music providing hours of enjoyment and easy listening. This is the music so many young musicians find accessible and is particularly appropriate for those pupils whose interest in the classics has faded. It sounds impressive and yet is less difficult than it seems, building confidence and restoring a sense of enjoyment. The music in the albums builds a bridge over the classics without neglecting them, linking to contemporary styles, as pop, jazz and musical. Good sound piano technique is encouraged and opportunities to practise scales and broken chords are provided. On these pages we introduce to you the music in the albums (and on cd's), with descriptions of its contents, score examples and mp3 audio clips. More about the audio at the bottom of this page. 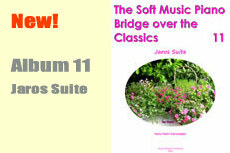 Album 11 in the series The Soft Music Piano Bridge over the Classics has been published. Hens Vlam-Verwaaijen, a graduate of the Amsterdam Conservatory of Music, was a piano student of the famous teachers Paul Frenkel and Jan Odé. She studied composition with Ernest W. Mulder and Hennie Schouten. 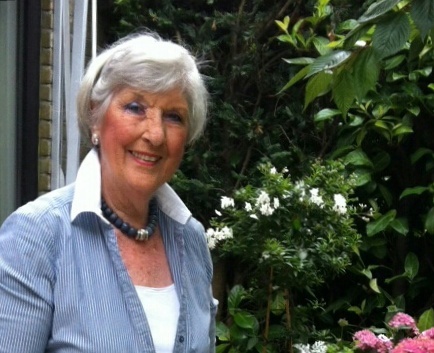 As a piano teacher she was struck by the discovery that after a few years many pupils lost interest in the classics and asked for more popular music. It was for these pupils that she developed the concept of Soft Music, fusing the elements of popular and classical music without neglecting the importance of good technique. Some more information on Hens Vlam-Verwaaijen, and background information on the Soft Music Bridge Series. 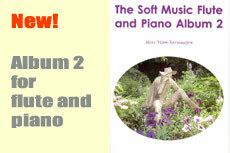 The title: From Vacuum Cleaner to "The Soft Music Piano Bridge". Read or download the pdf here. For everyone who wants to broaden his musical interest, from young to old, from starters (the 'Light' album 4 and 5) to more advanced players (album 7, Sonata Classica). Piano teachers searching for appealing music will recognize these albums as a pleasant addition to the existing repertoire. Where to buy the albums? The albums have been published by De Haske/Hal Leonard (former Harmonia) and Music Bridge Publishing. You will find them in the regular music shop. When they are not on the shelves they can be ordered by the shop. Where to buy the CD's? The CD's are not in the music shops; they are distributed by Hens Vlam-Verwaaijen. Below you will find the (email) address to order. For international delivery and prices please contact Hens Vlam. For delivery within Holland see the Dutch pages. When you see the mp3 icon you can load an mp3-sample of the piece. The examples are taken from the CD's. Mostly the mp3-examples are excerpts, i.e. the first 30 seconds of a piece. When the word ALL is added, you will hear the complete CD-track. It is normal that the loading of mp3-files takes a while, except when you have a broadband connection. When your browser has a media-player on board or a plug-in that can play mp3-files the mp3 will be played immediately after it's loaded. You may also want to save the mp3 on your harddisk and play it back later.